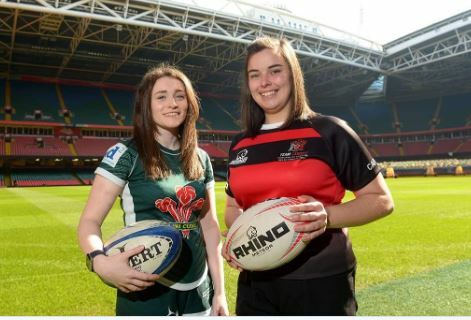 Swansea University women's captain Jessica McCreery and Cardiff University skipper Molly Danks. Pic: WRU. Wales forward Siwan Lillicrap believes today’s women’s Varsity match marks a significant step forward for female sport. The Swansea women’s player – who is also head of rugby at Swansea University – believes Wednesday’s fixture is helping cement the women’s game on an equal footing with the men’s. It is only the second time that both fixtures have taken place at the same venue, the Principality Stadium in Cardiff. Cardiff University will host Swansea University in the women’s game at 4.30pm, before the men’s sides meet later at 7.00pm. Lillicrap – whose Swansea team are bidding to win the Varsity fixture for a third successive time – said: “This is a huge leap in the right direction for equality in university rugby. Cardiff University head of rugby Alun Wyn Davies said: “Richard Jones has done a fantastic job with the women’s team and it’s fantastic that they are sharing the stage with the men’s team at the Principality Stadium. The men’s fixture, however, has been hit by a fixture clash which has forced Swansea University to field a second string XV. Swansea’s first team are playing a BUCS Super Rugby play-off final against Nottingham Trent. The women’s match is being shown live online at s4c.cymru (Welsh and English commentary), the Rygbi Pawb Facebook page (Welsh commentary only) and the S4C Youtube page (English commentary only). Coverage of the match between the men’s teams will be televised on S4C from 7pm, as well as being streamed live online at s4c.cymru (Welsh and English commentary), the Rygbi Pawb Facebook page (Welsh commentary only) and the S4C Youtube page (English commentary only). Extended highlights of both matches will be shown at 10pm the following evening, on Thursday, 11 April.